Gargati Fresh Pasta Tubes from Veneto. Gargati is a fresh egg pasta found, eaten and made only here in the Veneto region in Northern Italy. 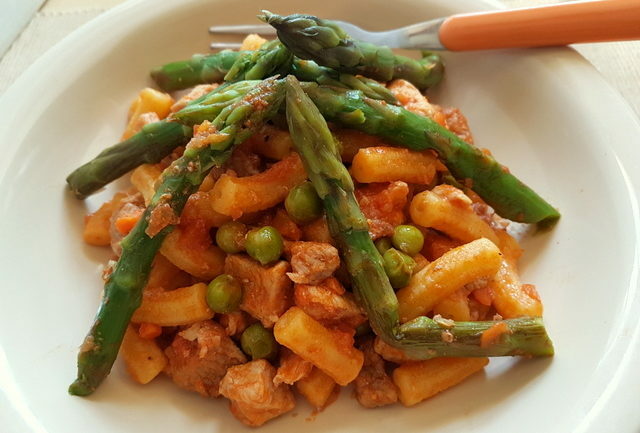 Although there is a similar looking pasta known as ‘subioti’ (still to feature on The Pasta Project). Gargati looks very like sedani or long maccheroni, but this is a unique type of pasta tube. Traditionally gargati is one of two types of pasta made using a hand operated pasta extruder called a bigolaro. The bigolaro was invented in the 1600s and was how Venetians used to make bigoli, the most well-known fresh pasta from Veneto. 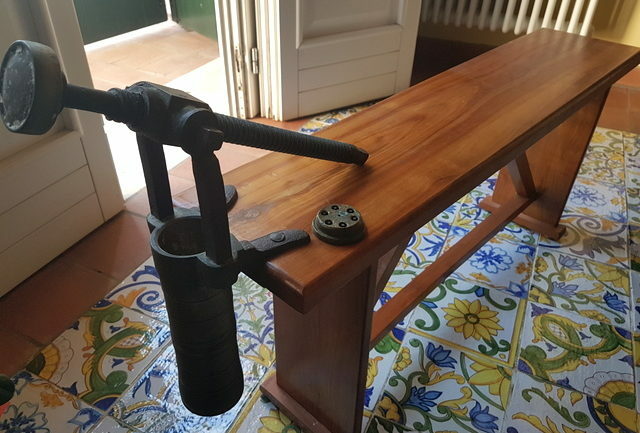 Once upon a time nearly all Venetian families had a bigolaro (also known as a torchio). However, nowadays, they are only found in a few homes and restaurants. You can read more about bigoli and the bigolaro if you click here. Gargati pasta is made with the same dough as bigoli (soft wheat flour, durum wheat semolina and eggs) The dough is kneaded for a long time until it’s smooth and quite firm. This is because to make gargati pasta, the dough has to be passed through an extruder and if it’s too soft it won’t hold its shape. The word ‘gargati’ comes from the local dialect for esophagus, ‘gargarozzo’. 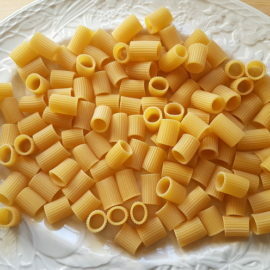 Although fresh pasta, gargati pasta tubes are quite firm. In fact, this pasta needs a bit of cooking time, considering it’s fresh. 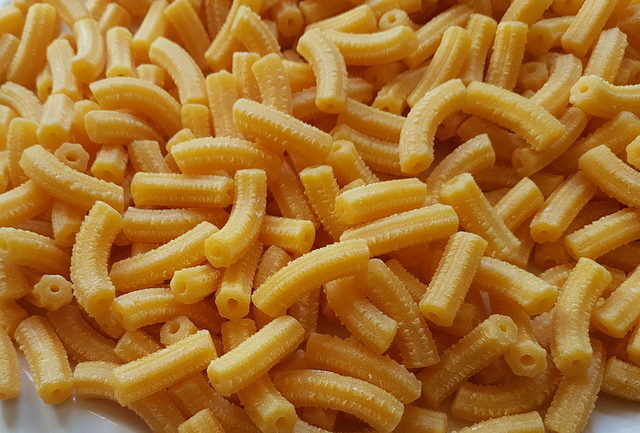 The hole in the middle is small and the sides of the pasta tube quite thick. 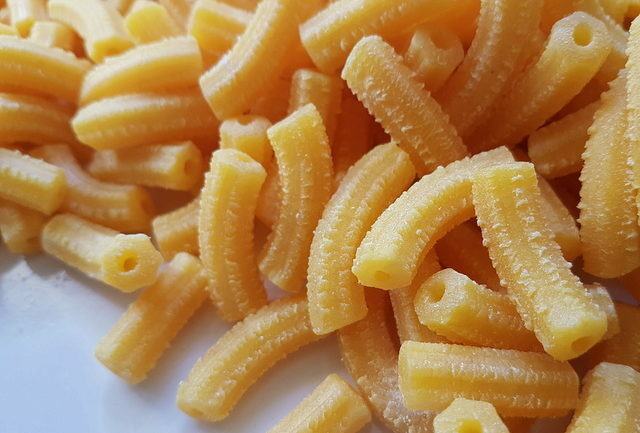 Traditionally, each gargati pasta tube is about 5-6 cm in length and 1.2 cm in diameter and is ridged (rigati) with a rough surface. The word gargati comes from the local dialect word for esophagus, ‘gargarozzo’. Gargati pasta isn’t as ancient as bigoli. In fact, it was invented in the post-war period as a result of the growing demand for different forms of pasta for the Venetian tables. 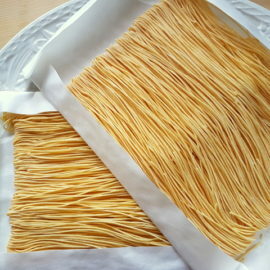 Nowadays, gargati pasta can be bought from fresh pasta shops or fresh pasta sections in some supermarkets, here in Veneto. My supermarket doesn’t stock it. But, I can buy it from a local cheese shop that also sells pasta and other foodstuffs. Some people make it at home using their own pasta extruder with a bronze gargati die. The most popular way to serve gargati is with a rustic sauce known as ‘il consiero’. 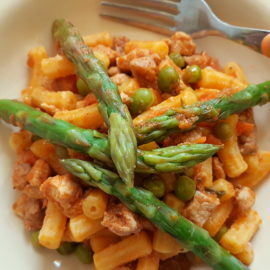 This is an interesting recipe because it developed over time as a way to use up leftover meat and seasonal vegetables. So the recipe changes with the season! This is the first recipe I have published for this pasta (see link below). And since it is spring my recipe includes white meat, asparagus and fresh peas! 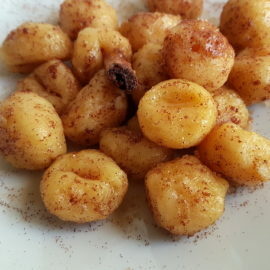 Another traditional recipe for gargati is with tastasal . Tastasal is a sauce prepared from a mixture of fresh minced pork, salted and seasoned with plenty of crushed black pepper. This is the same mixture used to make local salami. In fact, the name of this sauce derives from the stuffing process. Farmers cooked a handful of ground meat before making salami and tasted it to evaluate how salty it was before continuing with the sausage. The name of this condiment derives from this test. The word tastasal comes from ‘tastare’ to taste. Gargati is also eaten with a pigeon ragu or with a local sauce called ‘coi rovinazzi’. This is a ragu made with chicken giblets. Rovinazzi is also eaten with bigoli or in a risotto. I’m not such a big chicken giblets fan so not sure if I’ll try that one. But I’d like to make the tastasal and maybe the pigeon ragu! Although gargati isn’t a pasta you can find easily outside of Italy, I know some Italian restaurants in other countries serve it. 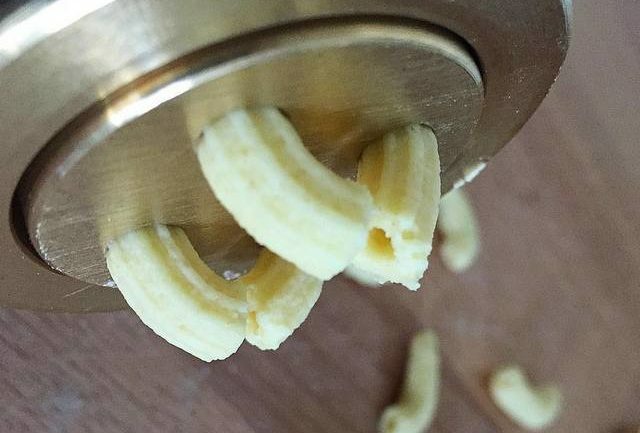 You can also make it yourself if you have a pasta extruder. 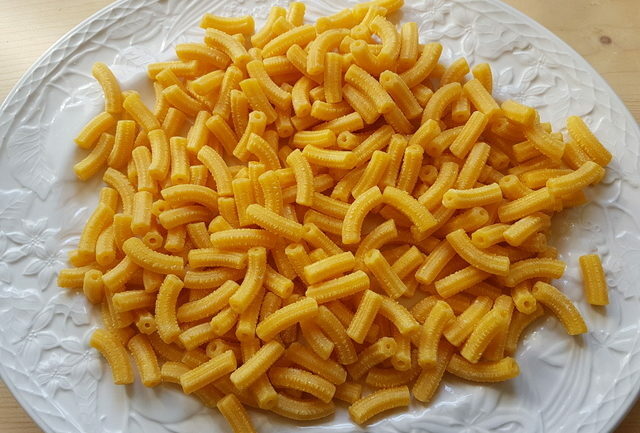 However, gargati recipes can also be made using other types of pasta tubes such as sedani or penne. And, if you happen to be visiting Veneto, look out for this pasta on restaurant menus. I’m sure you’ll like it.